I’ll be hosting two town meeting forums on veterans' issues on Tuesday of next week, September 19, from 2-4 p.m. The first one will be in Northfield at the American Legion Post 84. The American Legion is located at 1055 North Highway 3. This is next to the John Deere implement dealership. Then I’ll move on to Belle Plaine at the Veterans Club, 221 North Meridian Street. This forum will go from 7-9 p.m.
As usual City Administrator Al Roder has prepared a detailed report of everything that went on at City Hall last week. Everything's here, from police activity statistics to street closings and budget meetings. Just click here to read the pdf version of the report. You need Acrobat Reader to read the file. And head to the City Hall site to check out the complete city events calendar and find the agendas and other details for all meetings. The most important thing this week isn't a meeting, but Election Day on Tuesday. You can check the city site for information on polling places and other election details. The City of Northfield and Canines at Play (CAP), a volunteer organization dedicated to bringing off-leash dog parks to Northfield, have finalized a development agreement that would locate the first off-leash dog park at Babcock Park in Northfield. CAP Board Chairman Rich Lorang, a veterinarian who runs Countryside Animal Hospital in Dundas, and CAP board member Rick Estenson, an executive with First National Bank in Northfield, will present the agreement to the Northfield City Council on Monday, Sept. 11. The meeting will begin at 7 p.m. in City Hall council chambers, Washington and Ninth streets. Babcock Park is located on the northwest corner of Highway 3 and Woodley Street, just north of Southgate Cinema and adjacent to the outdoor hockey rink and the Defeat of Jesse James Days (DJJD) rodeo grounds. The proposed dog-park site has 1.4 acres along the Cannon River, with fencing and a separate area for small-breed dogs, should their owners prefer to keep them segregated. There are three candidates from Northfield running for District 2 of the Rice County Board, meaning that voters will have to narrow the field in the primary next Tuesday, Sept. 12. And now you have a chance get up to speed – in just one evening. Northfield.org and KYMN radio are hosting a candidate forum at 7 p.m. tonight, Sept. 7, in the City Council chambers at City Hall. Charles Skinner will be the moderator. The candidates are: Betsey Buckheit, Galen Malecha and David DeLong (left to right, above). We have asked them all some basic questions and we’re presenting their answers here. If you have a question or comment, feel free to add it to the comments at the end of this story. One other candidate, Bill Rossman, a former mayor of Northfield, has withdrawn from the race. We will have complete election results Tuesday evening. It's a holiday and City Hall is closed, but City Administrator Al Roder and his staff will be back to work Tuesday. As usual Al has prepared a detailed report of everything that goes on at City Hall each week. Everything's here, from police activity statistics to street closings and budget meetings. The election is almost here. What election, you say? Sure, you’ve been busy and it’s hard to keep up with the news and all, but there is a primary next Tuesday, Sept. 12. There are three candidates from Northfield running for District 2 of the Rice County Board, meaning that voters will have to narrow the field next Tuesday. And now you have a chance get up to speed – in just one evening. Northfield.org and KYMN radio are hosting a candidate forum at 7 p.m. Thursday, Sept. 7 in the City Council chambers at City Hall. You can meet them all, ask questions and compare their ideas – and still have time later to debate their merits over a beer at the DJJD festival. You just can’t beat that. New for 2006: Live election results! On August 31, I attended the Northfield area election judge training at the Northfield Community Recreation Center. County and city election officials handed out manuals and gave an overview of election day procedures, including the new procedures and the use of voting machines. While the Secretary of State's Web site provided state-wide election information and basic voter information last election, this year, the site will include local election information, too. The Sunday edition of the New York Times featured a piece in their Real Estate section titled, Why Some Towns Place Roadblocks on Cul-de-Sacs. The "Some Town" highlighted is Northfield, with quotes about the controversy provided by city planner Dan Olson and planning commissioner Tracy Davis. The article contrasts Northfield's stance with our near neighbor, Eagan. If you have trouble viewing the story from this link, Tracy Davis' blog also provides a PDF download. First, my apologies to City Administrator Al Roder and his staff. They sent the weekly report on time, but due to an oversight, I didn't get it posted as scheduled Monday. Ever wonder what happens at City Hall each week? Here's the scoop. Each week City Administrator Al Roder (left) shares the memo he sends to city officials summarizing all the work of all the departments. Everything's here, from police activity statistics to street closings and budget meetings. Just click here to read the pdf version of the report for last week. You need Acrobat Reader to read the file. And head to the City Hall site to check out the complete city events calendar and find the agendas and other details for all meetings. City Council meets at 7 tonight at City Hall for a quick business meeting to clear up the liquor license for the upcomming Defeat of Jesse James Days and then a work session. Candidate Information Session, 7 p.m.
Environmental Quality Commission, 7 p.m. I went to my my first election judge training for the year on Wednesday, August 9. Primarily, the training was for head election judges, like me, and city clerks. We were given a brief overview of the changes to the post election review process, and the new election equipment. Read the rest of this post for more information about the new equipment at beeby-us.com. Progress is being made on the new $2.85 million Northfield Swimming Pool at Memorial Field. The construction started on July 7th and target opening date is June 2007. 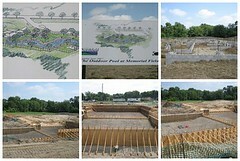 The pictures show several sections of the new pool under construction along with the sign showing the completed pool. More details, plans and documents can be found on the Pool Project section of the city website. Editor's note: Our thanks go to City Councilor and professional photographer Scott Davis of Stone Cottage Photography, who provided photos from Tuesday's groundbreaking. Click on the photo to see a few additional shots, or click here to go to his studio site and see a whole gallery of photos. Northfield Hospital broke ground Tuesday on an 18,600 square foot medical clinic that will provide space for the Women’s Health Center and an expansion of physician services provided by Cannon Valley Clinic -- Mayo Health System. The new clinic, called FamilyHealth Medical Clinic -- Northfield, will be attached to the northwest corner of the hospital. It will provide space for the Women’s Health Center and the departments of Internal Medicine, Pediatrics, General Surgery and Ear, Nose and Throat. Ever wonder what happens at City Hall each week? Here's the scoop. Each week City Administrator Al Roder (left) shares the memo he sends to city officials summarizing all the work of all the departments. There's a LOT here, from police activity statistics to street closings and budget meetings. Just click here to read the pdf version of the report. You need Acrobat Reader to read the file. And head to the City Hall site to check out the complete city events calendar and check out the details for all meetings for this week. City Council meets at 7 tonight at City Hall. One of the topics will be a recommendation by the Environmental Quality Commission to adopt an organic pest management policy, basically limiting pest control to organic products and processes. This is an information and is expected to be referred to staff for study.